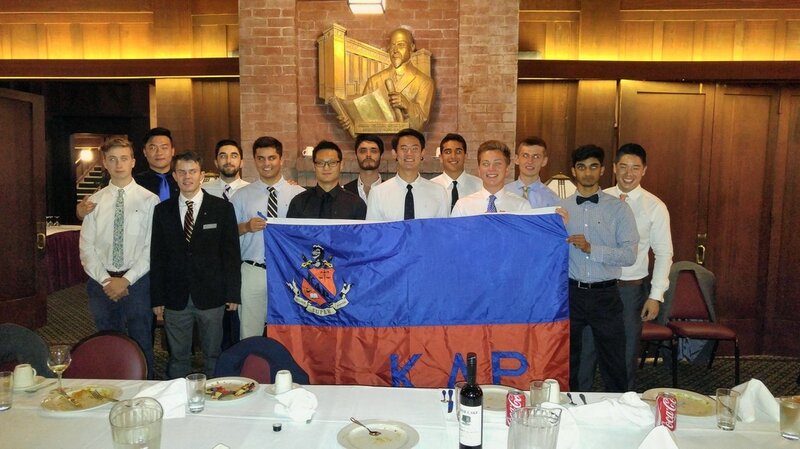 The Lambda Chapter Welcomes 13 New Pledges and Begins Recolonization at Cal. On October 8, the Lambda Chapter took its first steps in recolonizing UC Berkeley, by welcoming 13 new pledges - the first men who will eventually make up a new founding class for the Lambda Chapter. We're pleased to have so many men who embody the ideals and spirit of Kappa Delta Rho - honor, integrity, and service - and look forward to seeing their growth and the growth of the chapter. Calling all KDR alumni: if you're going to be in the SF Bay Area on the weekend of September 3-5, we'd love to see you on Friday night (9/3)! We'll be putting together a rush dinner, and have a broad representation of alumni there. More details are to come soon, but mark the date. If you think you'd like to come, email leadershipconsultant2 "at" kdr.com (John Reynolds, who is coordinating rush) and let him know. We're looking forward to seeing the results. It's a great first step in what will be a year-long effort to significantly improve the chapter house. Stop by on September 4th before the Cal-Davis football game to see the results! I want to update everyone on what is going on at Lambda right now. We're in summer (definitely a slow news season for KDR) but we're doing a lot of behind-the-scenes planning. A couple of weeks ago the chapter house renovation committee met to prioritize the upgrades we want to make on the house. Over the next 18 months we will be making some big changes and improvements to the house, and we're working to make sure that we can complete everything that we want done. Also, you should expect to receive a rather lengthy letter in the mail within the next 10 days explaining in detail the status of KDR and what we are doing going forward. And as always, we love to hear from KDRs about what's going on in their lives. If you have something you'd like to share, let us know and we'll put it in the next Lambda Lyre. Thanks and I hope you are all enjoying Summer! I want to give a big thanks to everyone who came out to this years Founder's Day Banquet last weekend. You guys made the night a really good time - I was especially happy to see Bob Lavalle who said was attending his first Banquet dinner! We talked a lot throughout the dinner about plans for renovating and remodeling the house. Although we have the beginnings of a plan in place, we'd love to hear from alumni who have experience with real estate, construction, and remodels. If you do, and have advice you'd like to share, you can use our contact form here to get in touch with me. Vitaliy, our secretary took many photos during the dinner and I've posted them up here on the site at Founder's Day Banquet 2010. Here's looking forward to another great dinner next year. Thanks again everyone. Well, we are two days away from the Lambda Chapter Spring Founder's Day Banquet. I always look forward to these dinners for a chance to meet up with brothers who I don't see very often, and hear stories from the 50s, 60s... all the way through what brothers have been doing recently. We'll be talking a lot about plans for renovating the chapter house and for rush in the fall.